I just noticed that the Oracle Forums changed again to the new version. Justin Kestelyn gives more information about the upgrade here. The new forum soft looks better than last time when it got upgraded (see my blog post about that upgrade here). It's a lot faster for me know, so that's already good. I did a reply to a question and everything went fine so far. So how do you start with a 55+ year old person to explain what APEX is, what it can do and how to use it? We started with a meeting. I didn't use a ppt, just my laptop and my Apex instance. I started with something he knew: Excel. I asked him an Excel file he uses a lot. Weeks before, we already discussed why APEX would be better in his case, so no time on that at this stage. Before we turned the Excel into an Oracle technology, I started to explain more about the concept of an Oracle database and how it works. I believe it was important to explain the relationship between database - scheme / user - tables - relationships. Next to do, getting an APEX account on apex.oracle.com and turning his Excel file into an APEX application. It's important to explain what's happening. Once the application was created and he understood what had been going on we played around with this app. 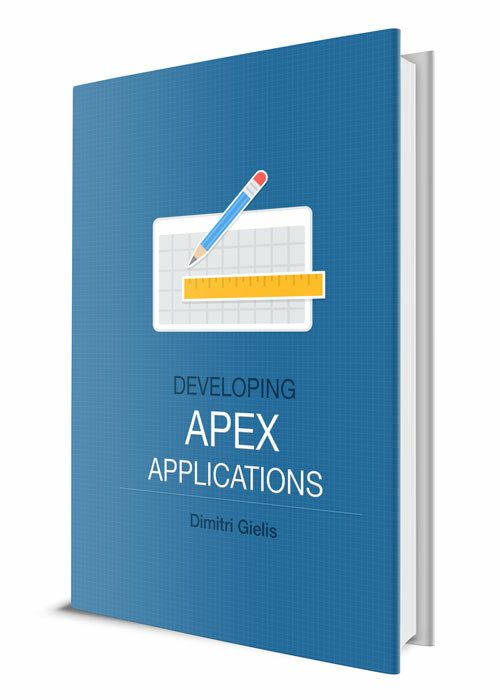 - Read documentation about APEX and its architecture. The theory is not everything, it's important that he tried things himself. So we started with the 2 Day + Application Express Developer’s Guide. The problem with this guide however is that you already need to know quiet a bit about Oracle (especially SQL) to understand fully what's happening. Everything is well explained how to create the application, but his feedback was that it was not clear to him what all the SQL (and others) meant he had to type/do or what was going on at the different points in time. He had the reflex to search himself for some things in the Application Express User’s Guide, but how to get rid of a table for ex isn't well explained. It's funny, all the steps are clearly in the guide, but if you don't know that "to delete" a table in Oracle is called "drop" you're in trouble. So most of the first questions I got were not about APEX itself, but more about the Oracle terminology. At this time he had made several applications in APEX (from Excel and from the guide) and seen other examples. We met again and discussed his evolution and what to learn next. I explained more about APEX and gave him his next exercise, which was one we use in our APEX beginners training. After that he felt confident to do other exercises, so he tried more exercises related to his job. Next post, next week: the good, the bad and the ugly! On Sunday the two big Oracle user groups are organizing an APEX session. 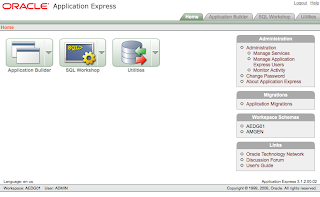 Sunday, from 10.00-11.30, I'm hosting the Oracle Application Express SIG: Ask the Experts session for IOUG. Just like the last two years this will be your chance to ask questions to a panel of APEX experts. Sunday, in the afternoon, Scott Spendolini is hosting the ODTUG Oracle Application Express Symposium session. Just as at Kaleidoscope different people come to talk about their APEX case studies. Apex Evangelists will also be in stage with one of our customers, AMGEN. We are 5th I believe and we'll talk about "Oracle Application Express--Power to the People". Most of the time Rich Mutell of Amgen will do the talking, but John and I will be there to do the intro and answer the more technical questions. There'll be a lot of APEX sessions at Oracle Open World this year, as due to the large number some sessions overlap eachother, so you would need to make a choice which one you want to see! I might post my session schedule later, but it was a difficult choice to pick the sessions! After a short holiday it's time to start blogging again. 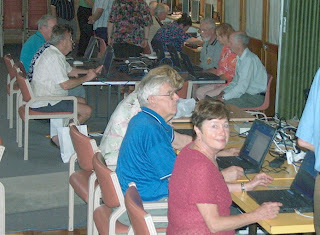 I already blogged about the idea of teaching APEX to people older than 55. So let's see how my pilot person looked like. It's a Belgian man, born in 1949, so almost 60 years old. His children are out the door, but he's still working as a mathematics teacher. 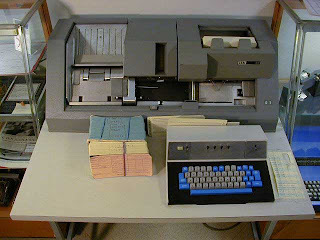 His first experience with computers was at university where he worked with a punchcard machine. After that he worked with an Apple II, IBM pc's and now he does his computer activities on a regular Wintel platform. In the early days he played around with Apple Works, WordPerfect and he even developed a bit with FileMaker Pro. Nowadays he's mainly working with Word and Excel and also communicates with his students with mail and through the internet. In his school he also needs to work with a planning tool, a Blackboard tool (online student system) and some other little programs. This person has always been trying to find ways to improve the quality of the lessons and other ways to help the students, the teachers and the school. So I would describe this person as a motivated 55+ year old working person, who has already some knowledge about pc's and knows Word and Excel well. When I was talking to him about Oracle Application Express and showed him some things he could use for his students and colleagues (for ex. to do follow-up or to plan classes) he was very interested to investigate more. Instead of me doing the application, we agreed to give it a try to get himself up-to-speed with APEX, so he could develop things himself. The timing was ideal as he had holidays. So we started in the beginning of July with this pilot program... APEX for 55+ (year old) people! He has his own desk with a Windows pc (not the newest one), Office, an anti-virus program and some other small software. He only knows Oracle from the stocks and some articles in magazines. He knows a tiny little bit of SQL, but doesn't know anything about webdevelopment, the Oracle database, PLSQL and APEX. In Part 2 I'll write about his first steps with APEX. During the holidays the number of blog posts I write is significantly less. If you follow the other blogs or watch on apexblogs.info you've seen most of the latest news. Nevertheless I thought it was a good idea to do a combined post of the APEX news of the last weeks. The Statement of Direction got updated. APEX 3.2 will be released "soon". In this version mainly the Forms Migration toolkit will be included. To get good input and do extensive testing, Oracle is searching for sample data and beta testers. If you want to help making the FORMS2APEX tool a success, read the full story on David Peake's blog. Every month I get a few requests to include new APEX blogs on the APEX Blog Aggregator. 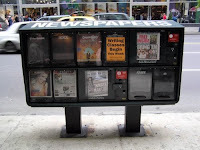 On ApexBlogs there are about 50 blogs aggregated, but not all of them are active (= still updated). The active blogs you should be able to see on the right hand site or in the slider of "Blog Selection" on the front page (if you click on it, it will slide down and show you all the APEX blogs). After a request of Noel Portugal, I've done some tests to provide you with a twitter feed of ApexBlogs. It seems to work, but I still need to do some code clean-up and make it nicer. I plan to provide you with this functionality in September. I'm using twitter more often myself now too, if you want you can follow me there as well (I'm logged as "dgielis"). In the past I used Metalink often as one of the references for a scalable APEX solution. It looks like in the future we can't do that anymore. Oracle changed direction and is trying to eat their own "dog-food". So to be clear, it's NOT because APEX has problems... Joel Kallman explains it on his blog. At Oracle Open World a record on APEX sessions will be held. Normally I create a conference scheduler for the APEX sessions, but this time David beat me and created it first. The app gives you a good overview about all APEX sessions and it's a nice example of an Interactive Report in APEX. I'll do another post later about the sessions I'll do and follow at OOW. There's also a survey going on about the integration of APEX with E-business Suite. So if you're using APEX in such environment and didn't fill in the survey, take some time to do it, I'm sure Oracle will love it and be able to provide you with "more" in the future. We're hosting another open European APEX Training Days, this time in the Netherlands. It's only a couple of weeks away and it looks like we'll have a good number of attendees. All information about that event can be found here. And not APEX related... the Olympics have started and the athletes are incredible. Not to speak about the unbelievable opening show! The last weeks I've been doing some interesting things. Normally I'm asked to train or coach people when they already have some experience in the IT-field, or know some things about Oracle SQL, PLSQL and APEX. Or I need to train youngsters who already know a lot about the internet and web development. But what about people who have no real IT experience and are 55+ old? Is it possible to let these people know something about web development and get them up to speed with Oracle Application Express? So I started a pilot project with one 55+ person to see how it goes. We're a couple of weeks further and I thought it's time to do a series of blog posts with the outcome. If you have some specific questions I should handle, feel free to leave a comment.